OAKLAND, Cali. — The Oklahoma City Thunder (11-6) have a lot to be thankful for this Thanksgiving. For one, they defeated the suddenly mortal Golden State Warriors (12-7) 123-95 in a game they controlled from start to finish. Another thing is that they avoided tragedy. Hamidou Diallo was carted off the floor after an apparent injury. Luckily for the Thunder and Diallo, all severe injuries have been ruled out. Diallo’s status has been categorized as an ankle sprain — Paul George even said “ankle sprain” in the locker room — and he was seen wearing a walking boot while using crutches afterwards. Diallo went out at the 7:17 mark of the 4th quarter with Oklahoma City leading 96-85. 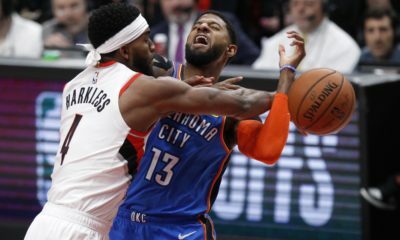 From there, the Thunder closed on a 27-10 run after the team looked visibly shaken by seeing their young rookie carted off the floor. Before Oklahoma City got there, they played some sound basketball on both sides of the floor. After holding the Warriors, who were without Steph Curry and Draymond Green, to 0-for-7 from three in the first quarter, Klay Thompson started feeling it. The All-Star wing scored eight consecutive points to tie it at 26 early in the second quarter. A textbook Golden State run. But Oklahoma City would respond. A theme that would continue throughout. Warriors run. Thunder answer. The guy who would do it? Dennis Schröder. After an abysmal performance Monday night which he himself took the blame for afterwards, Schröder exploded tonight for Oklahoma City. The backup point guard had a season high 32 points on 12-of-19 shooting including a career high five made three pointers out of his six attempted. It was what the Thunder made the trade for in the offseason. Year after year, the movie was the same. 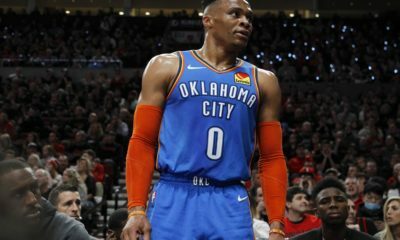 Russell Westbrook goes off the floor, Oklahoma City struggles. Westbrook has an off-night, the Thunder are in trouble. 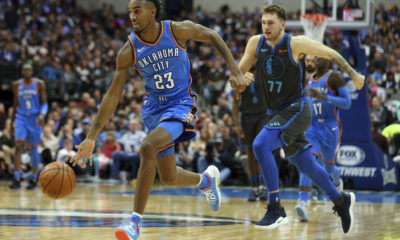 With Schröder, Oklahoma City has a serious threat to combat their opponents. Westbrook ended up with his first triple-double of the season — 11 points, 11 rebounds and 13 assists. With the obvious struggles to score, Westbrook allowed Schröder to take control. A welcome sight for Sam Presti, Billy Donovan and the Thunder. The first half was dominated in large part by Steven Adams. The seven-footer scored 16 of his 20 points in the first half and forced Steve Kerr to double team him in the second half. 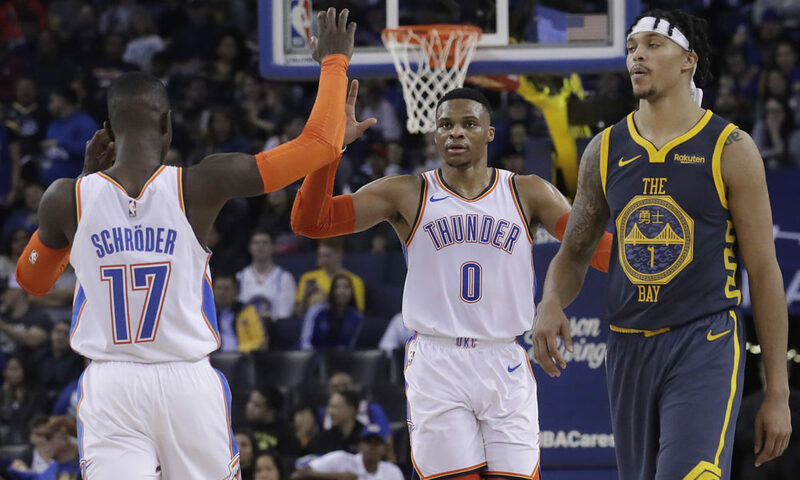 After being dominated in the paint last month against the Warriors in the paint to the tune of 56-34, Adams and the Thunder punished Golden State with 66 points in the painted area. The last gasp for the Warriors came on a 13-2 run to open the third quarter. Shots were falling and the crowd was beginning to come to life. That is until Schröder and George began to see their own shots fall. George finished with 25 points and went 3-4 in the third quarter to answer every Warriors run. With the Thunder’s win, Oklahoma City has won 11 games since October 28th. They have the best record in the NBA since that time. The Thunder return home for a back-to-back home stand against the Charlotte Hornets on Friday and the Denver Nuggets on Saturday.